I have a confession to make. I love shopping online. And I'm not alone, this is becoming the number one way that people buy goods. It's convenient, you can shop from your couch in your PJs. It's generally less expensive because online retailers don't need to rent space in expensive real estate. You can compare products and read review. For me it comes down to the fact that I don't need to interact with grumpy people in crowded buildings. 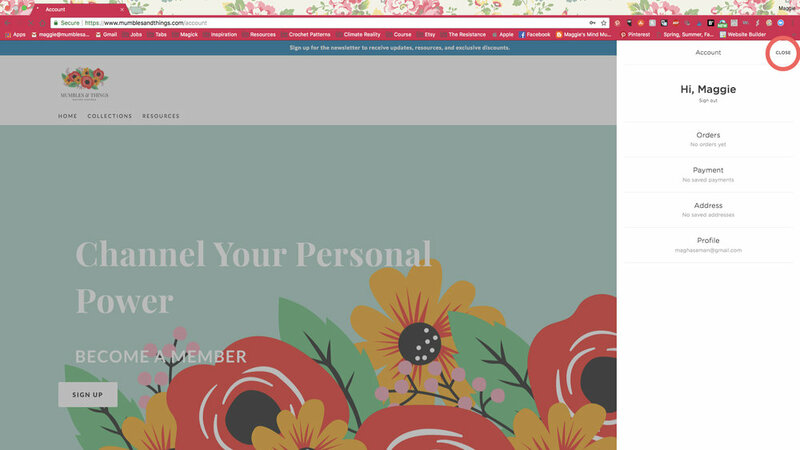 And when you buy online from a small business (like this one), an actual person (like me) does a happy dance! So I thought I'd make your online shopping experience even easier by showing you exactly how to make a purchase on this website. It's easy peasy! To log in to your account or make a new account follow these steps, it's super quick. See that little armless person icon? Click that first. When you click it you will see this box pop up. If you already have an account. enter that information here. You can select "Forgot Password?" if you can't remember. Click "Create account" if you don't have one yet. That will bring up this screen where you can enter your information. Select the "Create Account" button. When you are logged in you will see a form on the side of the screen that shows you how many orders you have made, and the methods of payments and address you have saved. Close this so that you can go shopping. There are so many ways to shop on Mumbles & Things. The easiest would probably be to look through the collections. You can find these in the navigation bar at the top of the screen. What do all those things mean? DIFFUSERS - These products include lava stones which means you can sprinkle a few drops of essential oils on them to carry the aroma benefits with you all day. BRACELET SET - These are bracelets that are sold in a set, but that's probably obvious from the name). SAVE THE BEES! - For every purchased bracelet from this collection, I make a donation to the Save the Honeybees Foundation to support their work educating the public about pollinator health, protecting the natural habit of pollinators and researching solutions to the decline in pollinator populations. NATAL JEWELRY - These products are 100% unique to you. I make a bracelet or necklace to match the position of the planets in the sky at the moment of your birth. Each piece comes with a detailed analysis of your birth chart. BEST SELLERS - The products that customers—like you—buy the most, or love the most, can be found here. SALE - If you're looking for the quality of Mumbles & Things, but want it at a discounted price, check the sale section. You can look at products using the Quick View feature where you'll see more angles, zoomed in pictures, the price and the option to add to cart. This is convenient so you can look at many products without the need to load a new page each time. Once you've found the piece (or several) that you just can't live another day of you life without, you'll need to select the size. Measuring your wrist for bracelets properly, is an important step of the buying process, so make sure to follow the steps on the measurements page. Select the quantity then click the add to cart button. You will see that the cart icon at the top of the screen (next to the armless person icon) now should have increased by the quantity you added. (In this case from 0 to 1). If you click the shopping cart icon, you will be brought to the page pictured below. This is your cart. It will hold all of the items you wish to purchase for you until you are ready. 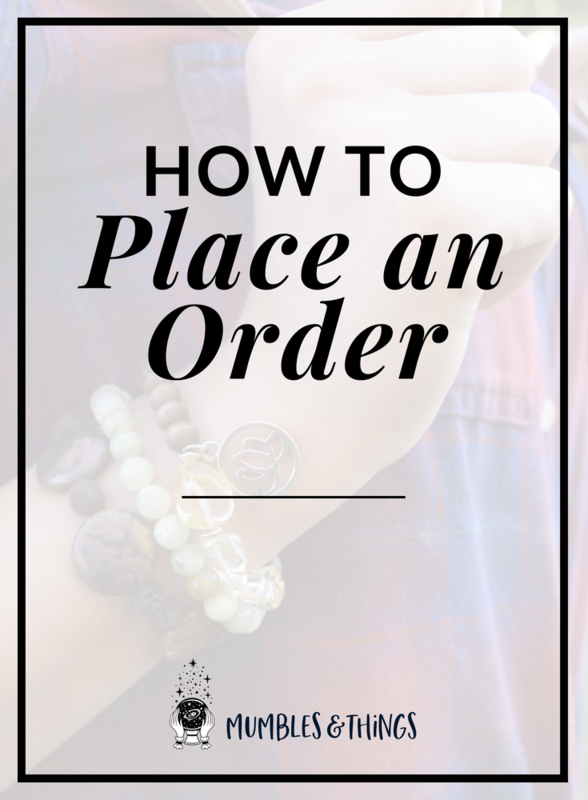 You may also use it as a wishlist, adding everything that calls to you and then coming to this page to narrow it down before placing the order. When you are ready, click the checkout button. The checkout button will bring you to a page that looks like the one below. If you made and account and are already logged in, your email address will already be filled in and you will skip ahead to step two. If you haven't logged in but have an account, make sure you click the sign in link to do so. If you have no account you will need to enter your email address to complete the purchase. I will use this to contact you about order status or if I have any questions about your order form. Whether you have an account or not, make sure the box is selected to sign up for the Mumbles & Things newsletter. Pretty cool, huh? I bet you want to sign up right now! The rest of this is pretty straight forward if you've ever made an online purchase. Nobody is reinventing the wheel around here! Fill in the form and make sure you enter the correct shipping address. I will send it to the exact address you put in here, so be sure you typed it properly. Keep in mind that shipping time is not the same as processing time. This is a one woman operation. I hand make every item that is available to purchase. This takes time and I appreciate your patience. Typically, items ship out 1-3 days after the order is placed. Read the Shipping Policy on this page to see rates for Domestic and International shipments and which International countries I currently ship too. Here you'll have an option to enter any additional information. If you are sending your purchase as a gift directly to the recipient, let me know here that you don't want anything that shows price. Or if you have selected custom size before adding the item to your cart (or if you forgot but now want a different size), enter your specified measurements here. Or if you just want to say hi, this is a good place (and the only place) to do so. There is also an option to enter your name. This is especially useful if you have opted to sign up for the newsletter (and why would you not? It's seriously amazing). It's so I can call you by your human name instead of saying, "Hey you, with the face." By default Stripe will be selected. This will mean you need to enter your credit or debit card information and billing address. You can select "Use Shipping Address" if it's the same so you don't need to enter it twice. You can also choose to checkout using your PayPal account. 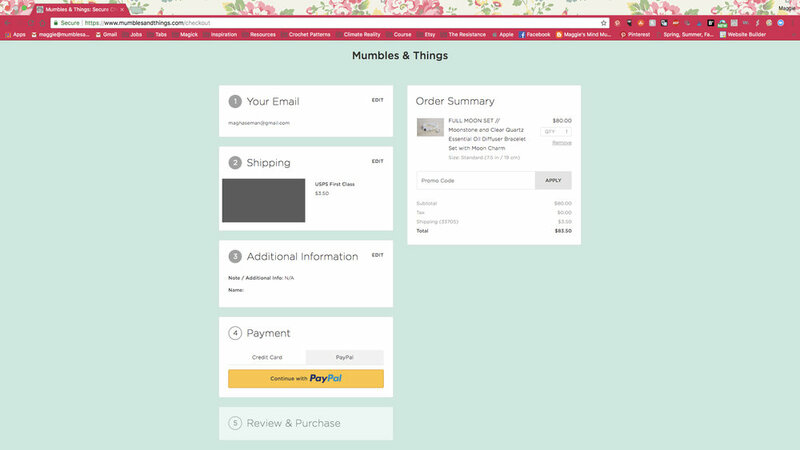 Just click the PayPal tab then click the big yellow button that says "Continue with PayPal". Another page will open in your browser where you can log into your PayPal account. Once you're logged in you will be able to click "Continue". Now you can review your order form. Make sure you entered the correct address and credit card information. 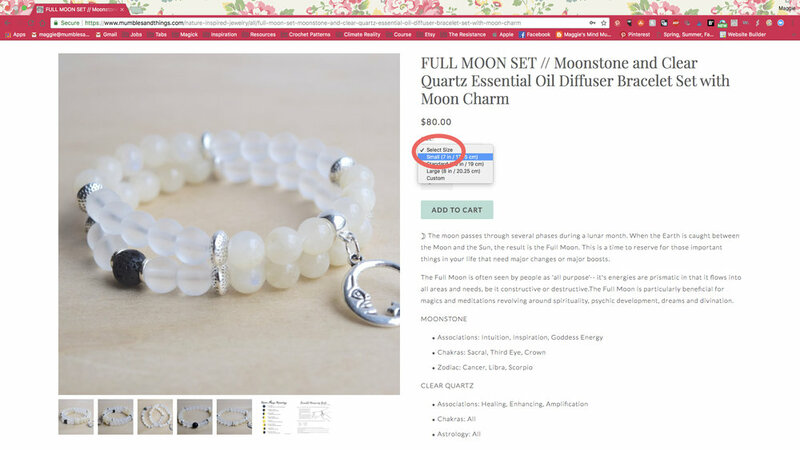 Double check the quantity you are purchasing so that you don't accidentally purchase duplicates (or that you have the number you need, if you want duplicates). Everything looks good? Click that button that say "Purchase". You should now see a screen that looks like this one. Keep track of you order number and make sure it matches the one in the email you will be getting shortly. How exciting! You are now a soon-to-be owner of an original design from Mumble & Things. and, finally, package it carefully so that it arrives to you safely. Orders generally take 1-3 days to process. Then there is shipping time after that. Most order arrive within the week though. When you support a maker, you're supporting more than just a product. You are supporting hundreds of hours of failures and experimentation. You are supporting them through days, weeks, and months of frustration and moments of pure joy. You are supporting their heART and their soul. Most importantly, you are supporting the maker to do something they love. As a small business I strive to meet and exceed the expectations of each and every one of my patrons. I appreciate those who support me and am humbled when people wear my designs. Which Mumbles & Things product caught your eye? Tell me in the comments below.